Education consultant Rob Saxton delivered an independent analysis of the Corbett School District and backed the idea of the district becoming a single-school charter school beginning in fall 2020. "This is a huge decision and should not be entered into lightly," he said in his in-depth 53-page report on the district. He recommended the community form a committee to conceive a vision for the high-performing district to finally end the rancor that has roiled the Corbett community over its schools for years. He also recommended other big changes to the district including shrinking the district and dropping a requirement that high school students take multiple college-level courses. Part of the end game of the visioning and planning process would be for voters to pass a facilities bond to fix some of the district's facilities issues, including the unsafe middle school. A community group called IC3S pushed for an impartial analysis of the schools to try to build a base of trust so the district could pass a bond. The district has tried and failed four times. In September, the district engaged Saxton to evaluate the district's finances and programming. Saxton was blunt in his critique of the divisions among different factions in the community. "Currently, the disagreements are so strong neither side is ever going to completely prevail, and frankly, neither side is completely right," said Saxton, the former head of the Oregon Department of Education, in the report. After the community creates the recommended "vision and values" document, the district should launch a strategic planning process, the report recommended. Saxton evaluated multiple aspects of the 1,225-student district in depth and discussed the most divisive issues. About half the students come from out of district and many community members object to this and want "Corbett schools for Corbett kids." The law that allows the out-of-district transfers has expired, so Corbett administration floated the idea of creating a charter school district to allow the district to keep educating kids who are not from Corbett and retaining the state funds that come with them. Schools are funded by the number of pupils they enroll, and Corbett administration feels it can provide students with the best education by having more students than live in the district. "I recommend the majority of students who attend Corbett schools live within the Corbett School District boundaries regardless of open enrollment or charter school status," Saxton said. "The District has a duty to ensure the education students are receiving is tailored to the students who live in the community." Saxton said the district, for example, would be able to do well with 871 students. "The question everyone will need to answer is this: Can we run our district on the funding 871 students will bring in? I am convinced the answer is yes," his report said. Another issue that causes a lot of controversy is the "AP for All" program of the district. The high school requires all students to take at least seven college level Advanced Placement courses to graduate. Saxton said, "I recommend the district move away from required AP courses for all students." He acknowledged many students thrive on the high expectations, but noted, "some students also feel trapped and hopeless in those courses." The report said many object to this expectation of students. They also complain that with the narrow focus on AP classes, there are not many other options for classes, especially in career and technical education (CTE). Saxton recommended bolstering the CTE program at the high school. He said the district and board should "begin the CTE program selection process immediately." 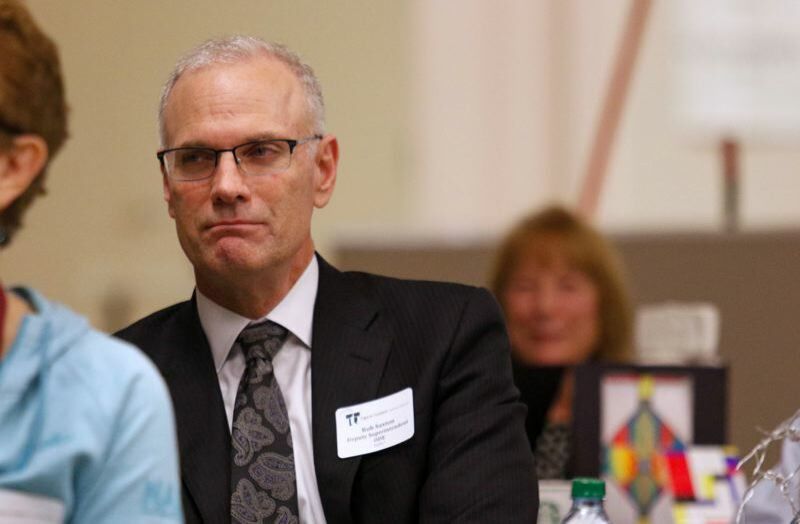 To be successful, the visioning and strategic plan would have to tackle all these hot-button topics, Saxton's report said, including total district enrollment, charter school status and the breadth and type of class offerings at the high school. Other items Saxton recommended the plan should address are: average class sizes, student outcome targets and community support of the bond and/or facilities and bond passage. "There is no doubt the Corbett community cares deeply about their schools, how they operate, and the taxes that they pay," the report said. "Corbett citizens have proven to be opinionated, outspoken, and for the most part continue to care about one another. They profess to want what is best for children who attend their schools, especially for those students who live in the community." Saxton ended his report by urging "that the individuals on all sides of these issues give each other some grace."